Everybody was nervous in the morning as they waited for the wind to fill in. The wind was too light to start racing the important final matches. Only after 1pm the postponement was lowered and the regatta was ready to continue. The day started with the semi-finals, both already in the situation of 2-0. Joachim Aschenbrenner (DEN) was leading Pierre Quiroga (FRA) 2-0, and Sam Gilmour (AUS) was leading Nevin Snow (USA) 2-0. In the first pre-start of today Aschenbrenner held Quiroga on the port side for four minutes, before approaching the start line from above. However things started to look bad for Aschenbrenner as the start approached because Quiroga was starting to get to leeward of them. They raised the spinnaker 10 meters from the starting line, and with only six seconds to go won the start just ahead of Quiroga. Aschenbrenner led the race at the first upwind mark and kept that led to progress into the finals. In the second semi-final match Gilmour took the right and met Snow at the upwind mark, he went behind, protested and got a green. Snow led until the last downwind leg, in the final rounding Gilmore loaded the gun, and the boats headed for the right corner. Both gybed simultaneously and Gilmore took the lead blocking the wind from Snow, Gilmore took the win and continued to the finals with a result 3-0. The final was raced to three points, and the petit final to two. In the first match of the final Aschenbrenner managed to approach the starting line first and shut the door from Gilmour by luffing, Gilmour had to tack and gybe so Aschenbrenner started well ahead. Aschenbrenner held the lead for the rest of the race even with Gilmour just two boat lengths behind on the final downwind. The wind dropped for the second match but that didn't stop Aschenbrenner's form, he took the pre-start, approaching first blocking the wind from Gilmour and kept the lead until the end, and was sitting now at 2-0. In the third final match the boats stood in the dial-up for 45 seconds. As they started to move backwards, Gilmour protested as the boats converged, but got a green reply from the umpires. As Aschenbrenner turned back to approach the starting line, Gilmour gybed in front of him and took the start. Gilmour sailed to the right of the course while Aschenbrenner sailed up the left. Gilmour rounded ahead at the first windward mark, but Aschenbrenner got a nice position above him. After both gybed Aschenbrenner went past Gilmour, rounding the downwind mark with a lead of two boat lengths. He held the lead until the finish and won gold with a 3-0 result in the finals against Gilmour having lost only two matches in the whole regatta. There was a lot of action in the petit final too. Snow started ahead, and kept the lead until the last upwind mark. After the rounding France took the lead, but gybed back to the right side of the course first. The finish was tight and Snow took the win with only half a meter. In the second match Snow started to windward in a quite even start. Quiroga managed to round the first windward mark ahead, but Snow was in position to strike. Snow gybed first to the downwind mark, taking the lead just before the mark. Snow led until the second downwind where the boats converged towards the pin end, with Snow approaching on port and Quiroga on starboard. Snow used his mark room, took the win, and the umpires gave a penalty on Quiroga. 2-0 for Snow giving him the bronze medal for the United States. 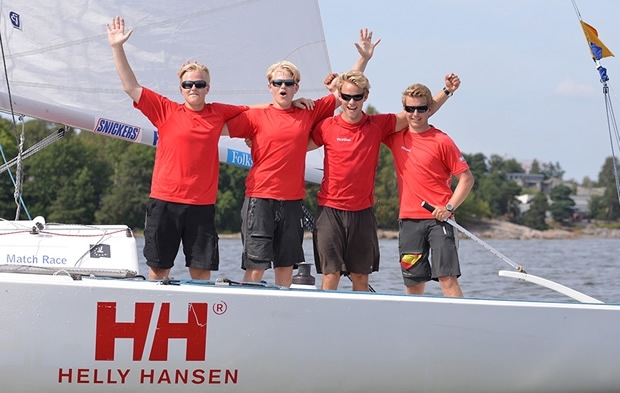 The event was concluded with the prize giving ceremony, where Aschenbrenner and the Danish team were given the youth match race world championship title. Aschenbrenner said, "Thank you NJK for hosting such a nice event. The level of race committee and umpiring was high throughout the event. Also thank you for my crew." Aschenbrenner is definitely someone to be watched in the future - at te qualifying stage of Stena Match Cup Sweden recently he dispatched he not only took out Mathieu Richard, Ed Baird and Keith Swinton, but his was the only team to beat four time World Champion Ian Wiliams.